Upset about moving from a big city to a small town, teenager Zach Cooper finds a silver lining when he meets the beautiful girl, Hannah, living right next door, and makes a quick friend in Champ. But every silver lining has a cloud, and Zach's comes when he learns that Hannah's mysterious dad is in fact R.L. 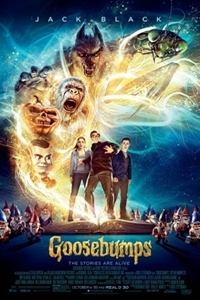 Stine, the author of the bestselling Goosebumps series. As Zach starts learning about the strange family next door, he soon discovers that Stine holds a dangerous secret: the creatures that his stories made famous are real, and Stine protects his readers by keeping them locked up in their books. When Stine's creations are unintentionally released from their manuscripts, Zach's life takes a turn for the weird.